I have always been a fan of Julie's books, right from the Iron Fey days. I've always kept my little Kagawa collection of books close to my heart, because I always know I'm in for one heck of a story-telling ride whenever I pick up one of Julie's books. 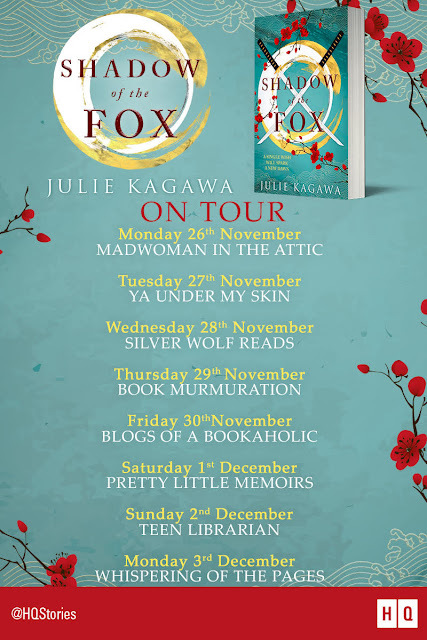 So when I got the chance to be a part of Shadow of The Fox's Blog Tour, I had to do it. It's Julie Kagawa, YA masterpiece writer! For me, this is definitely a highlight. I've always been in love with Fantasy books. Actually, when I started out with my blog, it was the main genre that I focused on. There's something about one of Julie's books that totally transforms the atmosphere where I'm reading into the story's landscape, this time into the world where a single wish has sparked a new dawn. The story is split into a few perspectives from different characters. There's Yumeko, who is a half-kitsune (anyone remember Kira from Teen Wolf? That's the kind of way I was basing a Kitsune from, because that's what she was). There's Kage Tatsumi, who is a samurai. Only every time he uses his sword (that's violently possessed by a demon) it hurts him whenever he uses it. On the other hand, Suki, another character, is entirely different from Yumeko and Kage. But giving away too much about the way Suki's character plays a part in the novel might give away too many spoilers. Yumeko has lived in a temple her whole life, until now. Now she's willed to protect a precious scroll. The way that Yumeko and Kage interact and their paths cross is unlike any other kind of character clash, but together, this kind of magic happens. They, along with some friends, get deep into a world of things that go bump in the night. There's demonic danger, thrills and an underlying mystery that I'll be careful not to tell too much about, because it's one of those kinds of ones where it's better unsaid (and you need to read it for yourselves ASAP because it's a favourite of mine this year!). Overall, I can't fault Shadow of The Fox in any way. It was a flawless plot, sometimes uneven pacing, but that really wasn't a concern of mine because the story itself made up for the pace of the tale. This was just so unbelievably enthralling and mythic-ally magical that I ate it up page by page. I'm really excited to see what comes next from Julie because she never, ever disappoints. Five stars! When not swimming for her life, Julie immersed herself in books, often to the chagrin of her schoolteachers, who would find she hid novels behind her Math textbooks during class. Her love of reading led her to pen some very dark and gruesome stories, complete with colored illustrations, to shock her hapless teachers. The gory tales faded with time, but the passion for writing remained, long after she graduated and was supposed to get a real job.To pay the rent, Julie worked in different bookstores over the years, but discovered the managers frowned upon her reading the books she was supposed to be shelving. So she turned to her other passion: training animals. She worked as a professional dogtrainer for several years, dodging Chihuahua bites and overly enthusiastic Labradors, until her first book sold and she stopped training to write full-time. 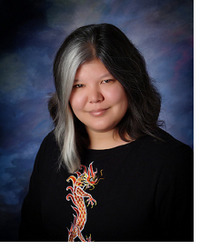 Julie is the author of the bestselling Iron Fey series. The Iron Knight the fourth title in The Iron Fey series publishes in Jan 2012. The Immortal Rules, the first title in a brand new series publishes in May 2012. There was a shimmer in the darkness, and the hairs on the back of my neck rose. Looking up, I saw a tiny, pale green figure, no larger than my thumb, watching me from atop a root a few feet away. It wore a round mushroom cap on its head, and its eyes were like black pits under the brim. Tatsumi saw what I was looking at, and his hand went to his sword. “Tatsumi, no,” I warned, holding out a hand. “It’s a kodama, a tree kami. It won’t hurt us.” He relaxed, dropping his hand from the hilt, and I offered the kodama a smile. The kodama didn’t blink. It watched me a moment more, then padded forward and hopped onto a stone, staring at me with pupilless black eyes. A faint sound rose into the air, like the rustle of leaves stirred by the wind. I nodded. “The monks taught me,” I replied. Not the whole truth of course; I’d been able to see the spirit world—kami, yokai, yurei and the rest of the unnatural—for as long I could remember. One of the perks—or curses—of being half kitsune. Though the monks did teach me the differences between the myriad spirits in Iwagoto. There were the nine greater Kami, the named deities who were worshipped throughout Iwagoto; Jinkei, god of Mercy, Doroshin, god of Roads, and so on. The lesser kami were minor gods, spirits of nature and the elements; they existed everywhere, in the earth, the sky and all places in between. No one knew how many kami existed in the world; when people spoke of them as a whole, it was common to say “the eight million gods,” and leave it at that. But besides the kami, many other strange, magical creatures roamed the land. Yokai were creatures of the supernatural; sometimes called monsters or bakemono, they could change their forms or had some amount of magic power, tanuki, kamaitachi and, of course, kitsune being prime examples. Yurei described the many restless ghosts that wandered the mortal realm, zashiki warashi, onryo, ubume and more. There were even some monstrous plants that preyed on humans and a handful of creatures that didn’t fit into any category, so the list of gods, ghosts and monsters was endless. But, even though some yokai were dangerous and some yurei had malicious intent, all were residents of Ningen-do, the mortal realm, and were to be respected. Unlike the demons—the amanjaku, and terrible oni like Yaburama. They hailed from Jigoku, the realm of evil and corruption, and did not belong in the mortal world at all. I love this passage because it feels very much like a scene from an anime, reminiscent of Princess Mononoke or Spirited Away, two of my favorites. It's strange, surreal, and just the tiniest bit creepy, and it also marks the beginning of Tatsumi and Yumeko's friendship. 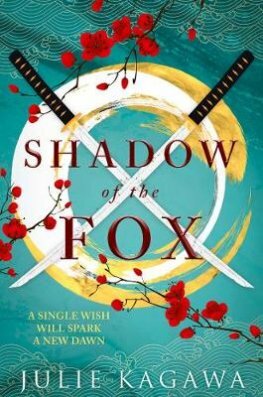 Have you read Shadow of The Fox? If you have, who was your favourite character?